Sugar substitutes in the form of artificial sweeteners can replace the sweetness of sugar, but the dangers of artificial sweeteners can make some of them a bad choice for your health! Refined sugars like sucrose, fructose, and high fructose corn syrup, are known to be detrimental to your health in a number of ways. The glycemic response (how fast blood sugar rises) is the primary reason why we seek alternatives to sugar. Refined sugar (sucrose) is processed sugar cane and is thus devoid of the vitamins and minerals that are naturally found in the sugar cane. This causes problems where b-vitamins are used up by your body trying to metabolize refined sugars. So goes the search for sugar substitutes that will not rapidly raise blood sugar and cause insulin to be elevated as well. Cutting down on or avoiding sugar is a good idea, but some artificial sweeteners are potentially worse for your health. I am not going to list all the artificial sweeteners. I will just focus on the ones you will most likely encounter for use in your foods. Like many other things it is often a matter of making the least objectionable choice, rather than a perfect one. Saccharin – Was the first of the sugar substitutes, and was synthesized in 1879. It is 300-500 times as sweet as sugar, but has a bitter aftertaste. It is used in products like toothpaste, diet foods and sodas to improve taste. The FDA almost banned it because research showed it was toxic in laboratory animal experiments. The cancer causing effect was not due to a DNA mechanism, so they felt it would not be cancer causing in humans, not a comforting conclusion about its safety. Cyclamates - were banned in the USA in 1970 due to proven cancer risk in lab animals, but are still used in 55 countries around the world. Aspartame – This is a combination of the amino acids L-aspartic acid, and L-phenylalanine. It is 200 times sweeter than sugar and has 4 calories per gram. It does not retain it’s sweetness when heated, and under some conditions, it can generate methanol (wood alcohol) which is toxic to the brain and nervous system. The methanol can further break down into another toxin; formaldehyde. It can also generate free amino acids. The one universally acknowledged problem with aspartame, as a sugar substitute is phenylktonuria, which is a genetic defect that prevents some people from properly metabolizing phenylalanine. Also called (Nutra Sweet, Equal, or Canderel) it is recognized as safe by health and regulatory agencies like the FDA (small comfort there). Unfortunately people from the FDA get jobs in the pharmaceutical industry, and vice versa. This creates a conflict of interest and leads to substances being approved that should not be. Many alternative health practitioners are wary of aspartame, which they consider a neurotoxin, because (they argue) it’s constituent amino acids can act like excitotoxins in the brain, potentially causing seizures and cognitive difficulties. Sucralose - unlike other artificial sweeteners is actually made from sugar by replacing 3 oxygen hydrogen groups in the sugar molecule with 3 chlorine atoms. It is 600 times sweeter than sugar. Because of its chlorination many in the alternative health field have warned against consuming sucralose. As far as its safety, I can’t say for sure that it is dangerous, but I would be wary of sugar substitutes that are artificially produced. Sucralose is considered safe by the US government and the European Union, however it would not be the first time that a dangerous substance was approved for human use. Sucralose is used in an increasing number of products, seems to be stable when heated, and has not bitter aftertaste. It is used by diabetes because it has no glycemic response, as do natural sugars. 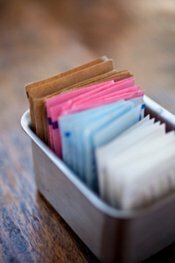 The dangers of artificial sweeteners are that they involve molecules that are not found in nature, and even though their makers (drug companies) claim they are safe, we have no way of knowing what the long term effects of these substances are when they are consumed for 10, 15, or 20 years! We have to take the word of the companies that produce these chemicals that they are safe. Pharmaceutical companies have a vested interest in these products being approved and sold. Knowing that they fund much of the research into their own products, they can’t be depended upon to supply accurate information as to whether these sugar substitutes are safe.